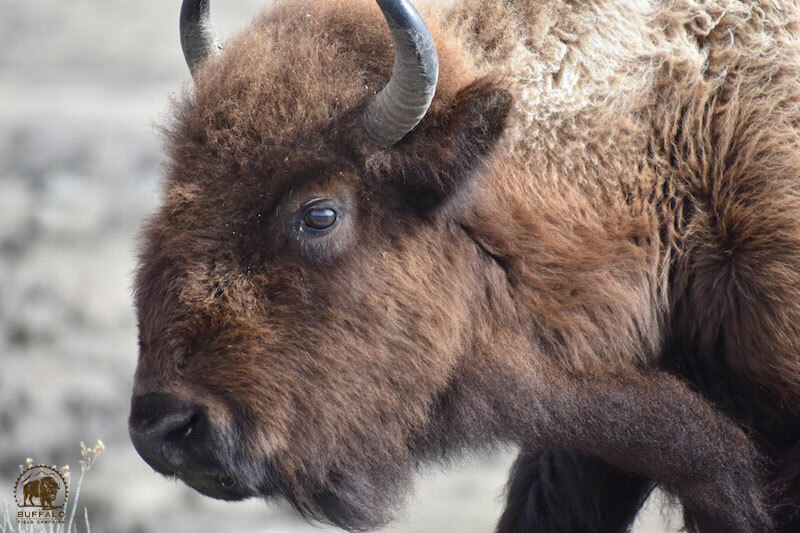 Yellowstone National Park has just released their 2017 “Status Report on the Yellowstone Bison Population,” and it reveals what we feared: the Central Herd, who migrates west into the Hebgen Basin, and also north, into the Gardiner Basin has declined by nearly half. 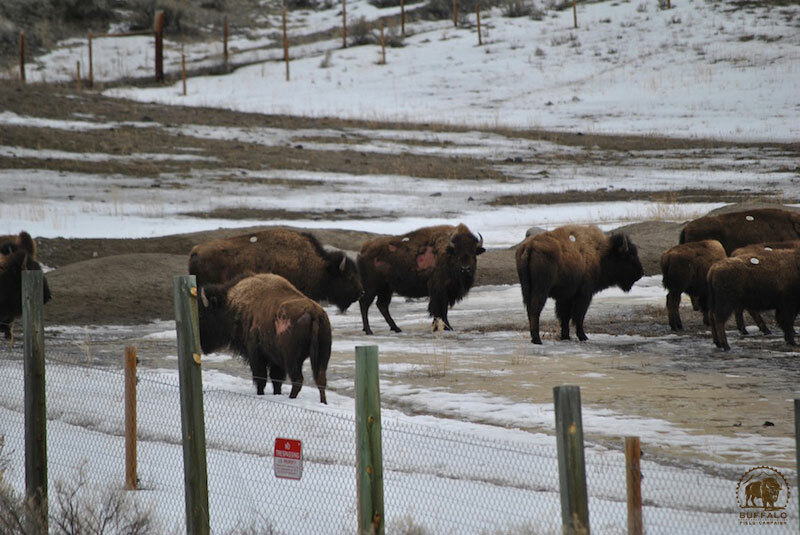 BFC patrols in the past few springs had noticed that we were seeing about half the number of buffalo coming to their calving grounds on and around Horse Butte. We looked for them inside the Park, but found very few. We contacted Yellowstone’s bison biologist, Rick Wallen, who suggested we look in the places we already had. Where had they gone? Well, the harsh reality is that, the Interagency Bison Management Plan (IBMP) is causing a fundamental and tragic shift in the buffalo’s behavior and migration patterns. Of course, Yellowstone will never admit this, heck they don’t even want to acknowledge that the Central and Northern herd have different genetic structures, much less what they are doing to the buffalos’ genetics as they arbitrarily slaughter them. TAKE ACTION! The only solution here is an immediate moratorium on Yellowstone’s capture-for-slaughter scheme. We must not allow them to move forward with their killing plans. Year after year we try to stop this, so we are going to have to try even harder now. We need you to stand with us on the front lines. 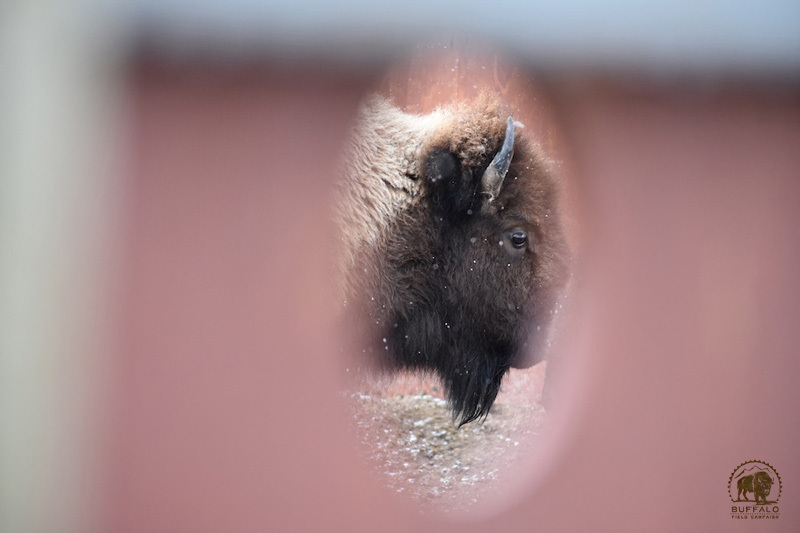 And we need you to let Yellowstone’s Superintendent Dan Wenk and Montana Governor Steve Bullock know that we will not stand by and allow this to happen: dan_wenk@nps.gov / 307-344-2002 – governor@mt.gov / 406-444-3111. 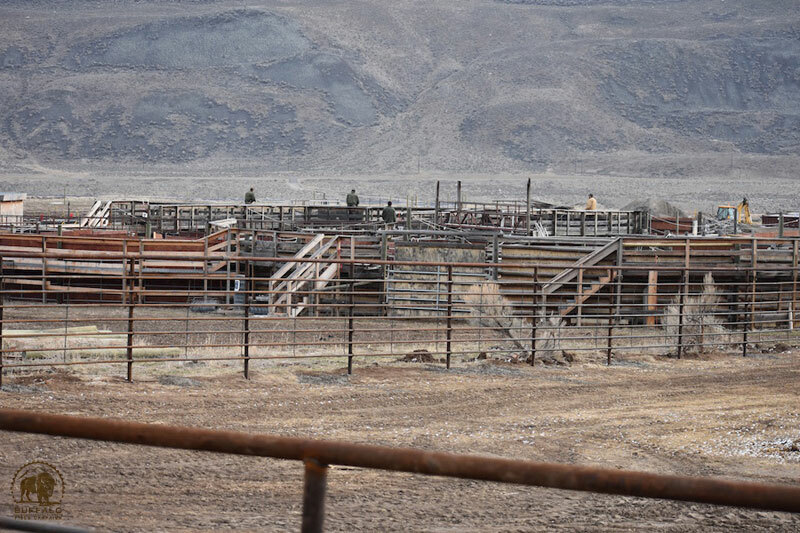 How dare they do this to these wonderful wild buffalo herds! It’s all so bizarre and happening right under our noses. It seems that efforts of advocates and even citizens with a general interest, are fragmented and limited by the innumerable other atrocities being committed against our wildlife and environment. It seems the best course is to support as generously possible the organizations that litigate on behalf of the animals. I wish mainstream media would devote at least a bit of air time to other issues such as this. Yes, it’s disgusting alright. Check out Wildlife Services. Google it and see the damage they are doing to hundreds of thousands of birds and animals a year in the name of sound management (at the request of the farmers and ranchers and anyone else who asks them, poisoning them and shooting them. No one has even heard of Wildlife Services and they hide in the Dept. of Agriculture, which authorizes all their nasty deeds! I have added a link to this update on my video (link below)as I think the whole world should see what is happening in Yellowstone Park and why they are doing nothing to stop the slaughter. Again – we need organizations who care about wildlife to educate the public that working at the ROOT of all wildlife killing is the fact that state and federal agencies that MAN handle our wildlife and public lands are structured to be funded primarily on killing licenses. Until we force change to structure them on GENERAL PUBLIC FUNDS either by a fee or by the wildlife watching funds that are 10-40 times the taxes paid in by hunters and trappers to state tax coffers and twice to federal ( but are not organized to fund what we actually want and are thrown into the general public funds to fund oil and fracking and factory farms). Until we change that basic structure, we will never have safe wildlife or democracy in governing our public lands and wildlife – we need a first time democratic system. Not to beat a dead horse, but the esteemed wildlife biologist Don Peay who Predicted the extermination of Yellowstone bison by wolves, and the Julius Streicher of the anti-predator world, none other than the exaulted Mr. Rockholm, who’s recent posting of an old video predicts the bison demise, addles one’s mind with the irony of this situation. It certainly does, when the demise of the Yellowstone bison will be because of humankind, and not the indigenous. How terribly ignorant and sad, for these people to be doing this. Once again, I repeat myself: HOW DARE THEY DO THIS??? WE MUST STOP THEM AND THE U.S. FISH AND WILDLIFE AND WILDLIFE SERVICES FOR ALL THE CRUELTY AND KILLING THAT THEY DO ON OUR PRECIOUS WILDLIFE! I AM SICK OF IT AND JUST CAN’T STAND IT! I am sick of reading things like this! Why do we have to put up with the slaughter of our precious wildlife? We have to put up with it because neither party gives a damn. Trump and his cronies may be bad, but there’s a very poor excuse for an alternative. What are you not understanding about this?! WAKE UP !!! What right do we as humans have to decide what species of animal will be allowed to servive? And in allowing only some and not all by our choice, we are inevitably wiping ourselves out in the end for nothing is sustainable if the chain is broke. As we know, bison are an annually migratory species, needing to come down off te long-winter Yellowstone plateau. Te mere fact that restricted bison can survive and still reproduce in excess of mortality there should not blind us to long-evolved behavior, which can be well-defined as cognitive/emotional need. Because I’ve been observing the constraints on wolf dispersal from YNP, engaged in by all three surrounding states, the CDC/WHO-looking infectious disease eradication maps and practices come immediately to mind. These draconian barriers to the natural vagility of bison should be shocking to all Americans. We know that bison contributed in key ways to the once-vast prairie and mountain valley ecosystems, precisely due to their mobility, cropping grasses to a very limited extent (unlike restricted European Bos cattle). From historical accounts of bison-dependent tribes and others who recorded their movements, along with more recent observation and experiment, that this passing-cloudlike mobility was ever the norm, even though perhaps 60 million plains bison along with millions of other large and medium ungulates existed. State governments tend to have teir posts sought and filled by some of the wealthier exploitative elements, Montana and Wyoming being two cases in point. Unfortunately, even more socially enlightened federal administrations still hold to the fiction that happiness is money and this pursuit is or should be prioritized over all else. Such a culture leads very obviously to dissociation with te biological earth as it is, even though we remain utterly dependent upon it. Visit any community, and the most exploitative will have the loudest voice, always the most emotional. Whenever we gather into communities larger than an extended family, contention begins to loom larger than acceptance and amicability. We are evolved to violently fragment, as remaining in local numbers beyond those which allow stable local ecosystems is sure deterioration and greater mortality. Bison themselves exhibit a different fission-fusion style. Few of you know that at night, that late afternoon ambling toward tighter herding you may have observed, is very coesive. Bulls will sheperd the groups uphill from tje lush valley bottoms, calves protected within the unit. I have not explored the sociality of bison – who leads, who decides. It seems seamless in the darkness. Individuals, though, always vary, and communicate clearly their preferences when encountered; they know humans as predators, yet signal their arousal and spatial preferences in noncombative ways long before any defensive action is taken. They are more cognizant of us and our attitudes than most humans are of even teir own species. So, in the end, I have no answers other than giving way to the imperatives of this native, who needs to reattain its ecologically effective part in the sustaining of life on much of the continent. For the tragic present moment its lives are negated insubstantial, abyssally subservient to the accumulation of mere social status among overbloomed populations of a primate dissociated from the real world, increasingly self-absorbed by abiotic, dead, technologies. I do not know if intraspecies strife , disguised as politics and management decisions, can or will ever resolve again into an inclusive, whole, community. Those who speak for wolf or buffalo, gather momentary lip service by other individuals; but the shiny flickering, banging, clicking toys and self-aggrandizement always inundate all else within moments, hours, days, the turn of a head.